Several studies of canine spontaneous mast cell tumours have described mutations in the c-kit proto-oncogene. These mutations produce a constitutively activated product and have been suggested to play a role in the malignant transformation of mast cells. We hypothesize that the selective tyrosine kinase inhibitor imatinib mesylate inhibits signal transduction and induces apoptosis when tested in cutaneous canine mast cell tumour samples positive for mutation in c-kit exon 11. 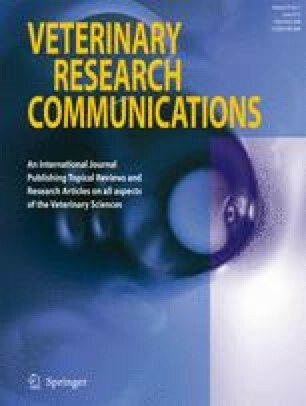 Three-dimensional ex vivo cultures of canine grade II mast cell tumour treated with STI-571 at 48, 72, and 96 h and tested for signal transduction and apoptosis using appropriate assays were used. There was a progressive and significant increase in caspase-3 and TUNEL-positive mast cells compared to the untreated cultures. Additionally, a concurrent reduced expression of Ki67 and BCL-2 was observed. Furthermore, the treated cultures showed a marked reduction of Kit expression. Our results demonstrate that STI-571 induces Caspase-dependent apoptosis in a canine neoplastic mast cells possessing mutations in c-kit exon 11.